Gmail is no doubt the most preferred email service people use. Not Just that, Gmail provides secure mailing option, thereby succeeding in making the user experience hassle free. Adding on to this are many keyboard shortcuts that make working on Gmail easier and even consumes less time. These keyboard shortcuts have been around since a long time but most of us are not acquainted to them and hence do not use them. In this article, we have covered all the important Gmail keyboard shortcuts that will make your work on Gmail a cakewalk. Login to your Gmail account and then look for the gear icon on the top right corner and tap on it. From the dropdown menu, click on Settings. From the Settings window look for General tab and click on it. Now locate Keyboard shortcuts options and choose the Keyboard shortcuts on option. Click on Save changes to save the changes made. Shift +C: Compose message in a new window. C: opens a new compose window. Shift + D: Opens the new compose window in a new tab. K: To scroll up through the mails in Inbox. J: To scroll down the mails in Inbox to look for old mails. N: This navigate to the emails that are relatively new than other mails in the same thread. P: To navigate to old mails in the same thread. O/Enter: If you want to expand any email in the thread simple tap Enter or O. Shift + I: This combination is used to mark a mail as read. Shift +U: This combination is used to mark a mail as unread. While composing an email if you want to save it as a draft, simply pressing Ctrl + S will do the work. To mark any mail as important all you need to do is press the + or = key while reading it. To mark it as not Important click, -. While on any email if you want to select it, press X key anywhere and the mail will be selected. R: To reply to an individual press R key on any mail you wish to reply to. A: To reply all press the A key. F: Forward any email be pressing F key. While wanting to move any mail to trash press the # key and it will be deleted. To label any mail, either open it or select it from the Inbox and then click the L key. Pressing this key opens up the dropdown menu, from where you can label the mails. To zoom out any message click Ctrl and + key simultaneously. Likewise clicking Ctrl and – key will minimize. Suspicious of an email, want to mark it spam, simply press the exclamation mark ! and the mail will be marked as spam. * and a: press both these keys to select all the mails. * and n: press both these keys to deselect all the mails. 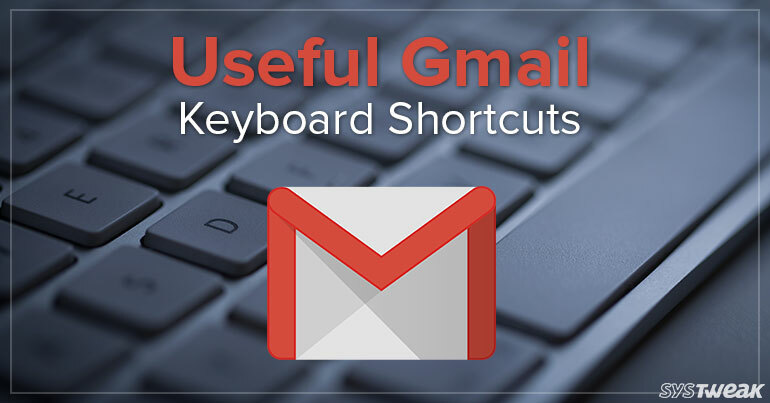 With these easy to remember keyboard shortcuts, accessing Gmail becomes a cake walk. Do let us know how do you find the article in the comments section below.